The Memorandum of Understanding (MOU) that EISA entered into with the Zimbabwe Electoral Commission (ZEC) in 2011 provided for support in providing voter education to Zimbabwe citizens through a consultative process with stakeholders as part of the ZEC's five year strategic plan. In line with this agreement EISA undertook the activities outlined below. 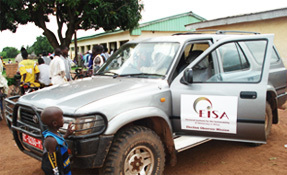 EISA provided technical expertise to the development of innovative voter education materials, includeing gender sensitive and inclusive voter education campaign portfolios for the provisional voters roll inspection and polling processes. EISA supported ZEC to put in place a well designed and implemented voter education programme, the printing of materials and the development and the review of outreach campaigns. EISA supported the translation of voter education materials developed in March at the development workshop from English into all the other 15 official languages in order to ensure inclusivity and maximum citizen participation in the elections. EISA Zimbabwe provided technical support to a three day workshop to develop voter education campaign materials on voters' roll inspection and polling proceedures in anticipation of the 2018 elections. Using a participatory approach, the workshop employed group work discussions, presentations and plenary. Gender mainstreaming was infused in all discussions so as to ensure that the campaign messages were gender sensitive. Provincial Voter Education Coordinators (PVEs) and Civil Society Organisations (CSOs) took part in the development of the materials. A total of 54 people of which 26 were women took part in the workshop at the Zimbabwe Institute of Public Administration and Management in Mashonaland West. The workshop was held in collaboration with the United Nations Development Programme (UNDP) with the financial assistance of European Union (EU). In order to assess the voter education strategy, EISA conducted a monitoring exercise of the voter registration blitz in selected provinces, namely, Harare, Manicaland, Midlands, Mashonaland West and Masvingo, between December 2017 and February 2018. Observations made from this exercise were shared with the ZEC for consideration. EISA supported the printing of voter education materials include 1,310,000 pamphlets, 1,259,250 flyers and 633,759 facts sheets. Materials were printed in English, Shona, Ndebele, Shangani, Venda, Kalanga, Ndawu, Sesotho, Nambya and Tonga languages. EISA supported two meetings in December 2017 where the ZEC met with CSOs and with faith based organisations accredited to conduct voter education. These stakeholders have played a key role in voter education for the BVR and this meeting gave them the opportunity to reflect, with the ZEC, on what was working and what was not working as far as public outreach was concerned. One major concern out of this meeting was that of the 40 organisations that were accredited to provide voter education, only half were visible on the ground largely due to financial constraints. A total of 52 participants took part in the CSO meeting while 58 attended the FBOs meeting. The Electoral Institute for Sustainable Democracy in Africa (EISA) is providing support to the Zimbabwe Electoral Commission (ZEC) in the mid-stream review of voter education for the ongoing Biometric Voter Registration (BVR). 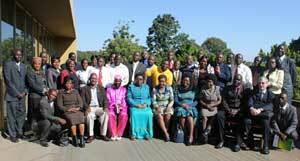 EISA supported a review workshop held on 28 and 29 November held in Mazvikadei Resort in Mashonaland West Province. The workshop was attended by 43 participants from ZESN, ERC, WIPSU, ZIMRIGHTS, Ambassador 263, CCJP2, ZORA, Deaf Zimbabwe Trust, UMYF, ZPF, YETT, YVP and NASCCOH and the ZEC provincial voter educators,. The BVR process started in September 2017 and a BVR mobile campaign blitz commenced in October 2017 and expected to end on 15 December 2017. A number of challenges have been identified by the ZEC and electoral stakeholders warranting a review in order to take corrective measures before the end of the process. voter educators deployment that did not consider language barriers leading to people being deployed in areas where they did not understand the local language. EISA is supporting the Zimbabwe Electoral Commission (ZEC) in the voter education training of Master Trainers for Biometric Voter Registration (BVR). 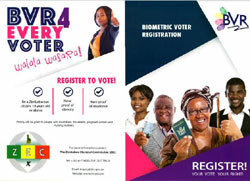 Biometric Voter Registration (BVR) is a newly adopted system to be used for registering voters in Zimbabwe for the 2018 elections. The intention is to train 8000 voter education officers countrywide at provincial and district levels. The ZEC will be conducting voter registration for the first time in line with the constitution adopted in 2013. The workshop content covers voter education and information for the upcoming national voter registration exercise and to familiarize participants with the legal framework governing elections broadly, and voter education and voter registration specifically. Forty one participants drawn from ZEC provincial voter education coordinators and officers and ZEC head office are attending. The workshop is part of EISAs technical support to ZEC for the 2018 electoral processes. EISA supported the Zimbabwe Electoral Commission (ZEC) in holding two back-to-back workshops on Voter Education Strategy (2016-2020)Stakeholder Consultation and Voter Education Materials Development for the Biometric Voter Registration. The second workshop was jointly organised with the United Nations Development Programme (UNDP). Forty five participants comprising 26 women and 19 men attended the workshop, drawn from CSOs, FBOs, ZEC, UNDP, UN Women and EISA. The Voter Education Strategy Stakeholder Consultation workshop is a sequel to the Voter Education Strategy workshop held for ZEC personnel in January 2017. Its objective was to consult electoral stakeholders notably, Civil Society Organisations (CSOs) to input into the draft Voter education Strategy. The Voter Education Materials Development workshop was aimed at developing voter education outreach and communication messages for the forthcoming Biometric Voter Registration (BVR) process in preparation for 2018 Harmonized Elections. The materials development workshop was a significant milestone in the ZEC/CSO relationship as prior to the workshop, there was no systematic and comprehensive approach to the development of materials and voter education and monitoring and evaluation framework. The two workshops were successful in two ways: ZEC and CSOs adopted the Voter Education Strategy a platform provided for CSO participation in the shaping of the Voter Education materials content for BVR campaign. It is anticipated that ZEC and CSOs will conduct a coordinated and comprehensive voter education programme during the registration and election processes ahead of the 2018 elections. 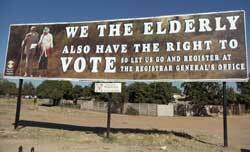 Pursuant to its voter education efforts in preparation for the Harmonised elections, the Zimbabwe Electoral Commission (ZEC) has with the support of EISA has begun producing and installing Billboards across the country. These billboards carry faces of popular Zimbabwean public figures like soccer stars and musicians and their messages encourage people to register and to participate in the electoral process. 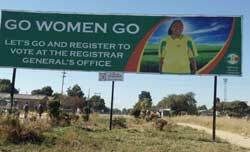 An initial 83 bill boards will be put up in rural and urban centres at strategic points such as market places, central business points and major street corners to reach out to as many electorates as possible in all the ten provinces of Zimbabwe. The production and installation of these billboards is timely as it coincides with the 30-day voter registration and inspection period that commences on Monday 10th of June 2013 and ends on the 9th of July 2013, in accordance with the provisions of the new constitution. Over 50 billboards have already been installed as of mid-June 2013 and the remaining 33 will be completed by the end of the month. The billboards are produced in three main languages which are Shona, Ndebele and English to facilitate accessibility. The production of billboards augments existing voter education tools such as pamphlets, posters, voter education hand books and flyers which have been produced in 8 languages since 2012. 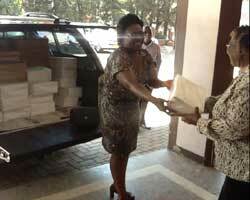 Millions of these materials have been distributed by ZEC countrywide. The Zimbabwe Electoral Commission (ZEC) and EISA held two back to back Voter Education Workshops for Faith Based Organisations. These were the first workshops that ZEC conducted specifically for Faith Based Organisations (FBO) after similar workshops with other electoral stakeholders since 2012. 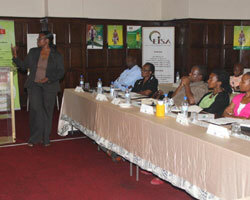 The First workshop was held in Harare at the Rainbow Towers' from 27th to the 28th May 2013. 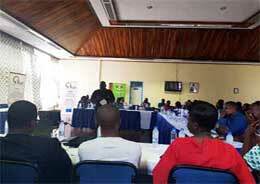 The second workshop was held in Bulawayo at the Bulawayo Rainbow Hotel from the 30th to the 31st May 2013. Having held training workshops for CSOs, media and political parties respectively, ZEC and EISA had noted that there still existed a need to build the capacity CSOs broadly defined so as to ensure maximum participation in the electoral process. The Faith Based Organisations (FBOs) were identified as a strategic constituency which does not usually affiliate to the traditional CSO umbrella organisations in the country. The objective for the two workshops was therefore to ensure that FBOs effectively participate in the electoral process. It had been noted through interaction with individual church leaders that most FBOs desired to be involved in the electoral process and needed to be equipped with the requisite skills and understanding of the process. ZEC and EISA also took the opportunity to explain the role of ZEC in the management of electoral processes as well as explain the Legal Framework and expected legal reforms in the Electoral law. The workshop also provided a platform for FBOs to raise all their concerns about the electoral processes. 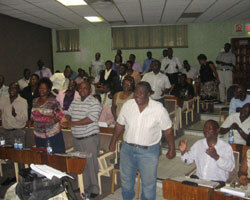 70 participants attended the Harare workshop and 66 participants attended the Bulawayo workshop respectively. Participants were mainly from the five major church umbrella bodies which are the following; Zimbabwe Council of churches (ZCC), Zimbabwe Catholic Bishops Conference (ZCBC), Apostolic Christian Council of Zimbabwe (ACCZ), Union for the Development of the Apostolic Churches in Zimbabwe (UDACIZA),Evangelical Fellowship of Zimbabwe (EFZ) . 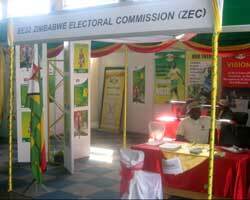 The Zimbabwe Electoral Commission has an exhibition stand at the trade fair in Bulawayo where voter education and voter registration materials are being handed out to hundred of crowds attending the trade fair. EISA has assisted ZEC with the printing of the materials for display at this exhibition. About 10 000 pamphlets in Ndebele, Shona, Sotho, Venda, Nambya, Tonga, English and Kalanga are being given to members of the public. Besides giving out materials, ZEC and the Officials from the Registrar General's Office are jointly registering new voters, verifying existing voters and facilitating the transfer of voters from one constituency to another. Voters and prospective voters were also requested to put their complaints and compliments In a record book at the stand so that queries which needed further attention could be attended to after the trade fair. 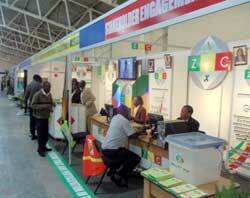 The ZEC stand is a manned by 8 ZEC Officals and 2 Officals from the Office of the Registrar General of voters. The whole Team is supervised by the ZEC Commissioners on site. The Zimbabwe Electoral Commission (ZEC) will for the first time involve civil society organisations (CSOs) in conducting voter education throughout the country. In 2011 EISA and ZEC consulted CSOs from across the country and invited them to contribute in the shaping of the voter education content. This consultative exercise culminated in the production of a voter education guide on which all voter education naterial for the coming referendum and elections will be based. In line with this progressive decision by ZEC to involve CSOs in voter education, EISA and ZEC conducted two train the trainer workshops for CSOs in Bulawayo and Mutare on 22nd to 23rd and 24th to 25th October 2012 respectively. The objective of the workshops was to train CSOs on the use of the voter education guide so as to ensure that they will communicate the same message to the electorate. These worskhops are a sequel to a similar workshop which EISA and ZEC had organised for the Provinsial and District ZEC officers who will be working with CSOs in their respective areas of jurisdiction in the run up to the referendum and elections. A total of 98 participants representing 40 NGO and FBOs were trained at the two workshops. In turn, these participants are expected to train members of their respective organisations using the same voter educations guide. During the same time ZEC will be considering applications submitted to it by CSOs which were represented at both workhshops for accreditation as voter education trainers. These CSOs will be expected to submit their voter education plans ZEC so that it can do oversight over the CSO voter education campaigns. 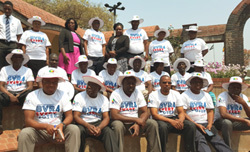 In preparation for the referendum and elections, EISA and ZEC conducted a train-the-trainer workshop for Provincial and District Election Officers in Kadoma, Zimbabwe from 15th to 17th October 2012. The objective of the workshop was to ensure a uniform approach to voter education for the forthcoming referendum and elections. A total of 85 participants consisting of 10 Provincial Election Officers, 62 District Election Officers and 13 Provincial Voter Educators were trained on how to conduct voter education using the voter education guide developed in collaboration with civil society organisations and political parties. After this training workshop, the participants will be used by ZEC to conduct a series of training workshops for civil society organisations Although ZEC is mandated by law to ensure that voter education is carried out countrywide, it has decided to involve CSOs in executing this mandate. These CSOs include among others the three main umbrella bodies namely, the National Association of Non-Governmental Organisations (NANGO), The National Association of Societies for the Care of the Handicapped (NASCOH) and Zimbabwe Election Support Network (ZESN). Once trained, the CSOs will be accredited by ZEC to caryout voter education throughout the country using the same voter education guide used to train the ZEC election officials. Top: ZEC Commissioner BF Nhandara addressing participants at the workshop. 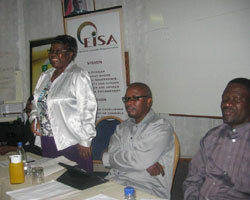 Next to her are the EISA Coutnry Representative and ZEC Deputy Director of Operations. Bottom: Participants doing one of the energisers at the workshop. The voter registration pamphlets and posters which have been produced by ZEC and EISA are being exhibited and distributed to the thousands of Zimbabweans who are attending the 2012 edition of the Harare Agricultural Show. ZEC is using this event to encourage people to register to vote in the forthcoming referendum and elections. Besides responding to all election related quiries from members of the public at the show grounds, the ZEC Officials who are manning the exhibition stand have computers on which the eligible voters who visit the stand can check their registration status. If they do not appear on the system they are directed to the relevant district offices for registration as most of them do not have the required registration documents in hand when they visit the exhibition stand. The Harare Agricultural Show started on 18th August and ends on 25th August 2012. EISA handed over voter registration posters, voter education guide and pamphlets to the Zimbabwe Electoral Commission (ZEC) on 16th August 2012. This is the first consignment of materials which are being printed by ZEC in collaboration with EISA ahead of the referendum and elections in the country. The materials were accepted by the Deputy Chief Elections Officer (Operations) on behalf of ZEC while EISA was represented by its Country Director. So far 19 000 voter registration posters have been printed consisting of six major languages. There are also 1000 voter education guide copies written in English and 2000 pamphlets also in English. The voter education guide is being transalted into the two other official languages namely; Ndebele and Shona. The pamphlets will be produced in 15 other languages and dialects in order to ensure effective outreach to all voters in Zimbabwe. A total of 6 000 000 voter registration, referendum and elections pamphlets will be printed. The printing of all the materials is made possible through the generous support of the Swedish International Development Cooperation Agency (Sida), the Royal Norwegian Embassy and the Canadian international Development Agency (CIDA). Click on the icons on the right to view examples of the voter education materials. A technical committee made up of non-governmental organisations, political parties and faith-based organisations identified from amongst the participants of the consultative forums was set up to engage in the joint development of the voter education material. This committee was charged with putting together a voter education manual based on the input from the forums. The technical team met over a five day period in November to prepare the draft manual. The committee went further and included designing and developing billboards, pamphlets and posters as well as identifying other avenues to ensure that voters for the forthcoming referendum and election will be well informed and familiar with the processes. 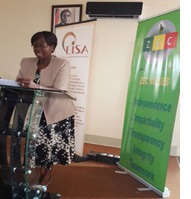 Recognising the role that CSOs play in accessing members of the public and providing the public with electoral related information, ZEC convened two inclusive stakeholder conferences in its efforts to reach out to this important stakeholder. To ensure an open invitation and the inclusion of a diverse sector of the population, ZEC advertised the events in local newspapers and held consultative forums in Bulawayo and Harare. Both conferences sparked a great deal of interest with over 100 participants from civil society and faith-based organisations attending as well as representatives from political parties, government institutions and other interest groups. Participants discussed the curriculum that a voter education programme should contain and a strategy for reaching out to voters. As voter education is a vehicle to provide updated and accurate information to prospective voters, being able to bring stakeholders together to agree on developing a common approach and methodology in providing members of the public with accurate and timely voter education and information was a major achievement.